In 2015 Bible Societies assisted in the completion of translations in 50 languages spoken by nearly 160 million people. 2015 was ‘a first’ for no fewer than 28 languages, spoken by nearly 33 million people. 11 communities now have their very first full Bible, 6 have a New Testament and 11 communities have their first, or additional, portions of Scripture. Languages are constantly developing so Bible Societies are also committed to revising existing translations and providing new translations, when requested, to help as many people as possible engage with the message of the Bible today. In 2015 this resulted in a further 20 new translations and revisions plus 2 study editions with the potential to reach over 127 million people. 285 million people are estimated to be visually impaired worldwide, of whom 40 million are blind. A Braille Bible usually consists of more than 40 bulky volumes making the transcription and production of a complete Bible in Braille a significant undertaking. Last year over 150,000 visually impaired people in Sri Lanka were given the potential to read the Bible for themselves with the completion of the Sinhala Braille Bible. This is the 44th language to receive a full Bible in Braille. In Mexico the first Braille portion in the Purepecha language was produced. Additional Braille portions were also added in Spanish and Armenian as well as a new Dutch Braille Bible. Sign Languages is the first or ‘heart’ language for 70 million deaf people worldwide and there are over 400 unique Sign Languages. The New Testament is only available in American Sign Language and this is the largest portion of Scripture currently available in Sign Language. The UBS, in close partnership with other international ministries, is seeking to meet this Scripture need for what is now recognised as a major unreached people group. Bible Societies are currently partners in 14 ongoing projects and another 9 are just beginning or in the planning stage. In 2015 the Ceylon Bible Society published Sign Language selections from Acts. Hungary and Lithuania produced the first ever drafts of Mark’s gospel. Brazil produced 15 new Bible stories in Sign Language and the Mexico team completed Luke and Acts. The ViBi team in Japan has completed Exodus, Titus and Ephesians and is aiming to complete the whole Bible by 2033. For full details of the languages published in 2015 see the Appendix. In 2013 United Bible Societies identified 100 full Bibles that could be translated by the end of 2015. We are pleased to report that 90 have completed the translation stage with 53 published and encouraging their communities, and 37 in pre-production or printing. Please pray for all those working on the remaining 10 translations that they will be able to complete their work as soon as possible. Please also pray for two confidential projects which have been completed but need permission from the authorities before they can be published. Figures as as 31.12.2015. We thank Bible Societies, Wycliffe Global Alliance and other translation agencies for their help in compiling these statistics. The figures for the number of language speakers is based on the best available data which currently totals 6.5 billion, less than the actual world population. 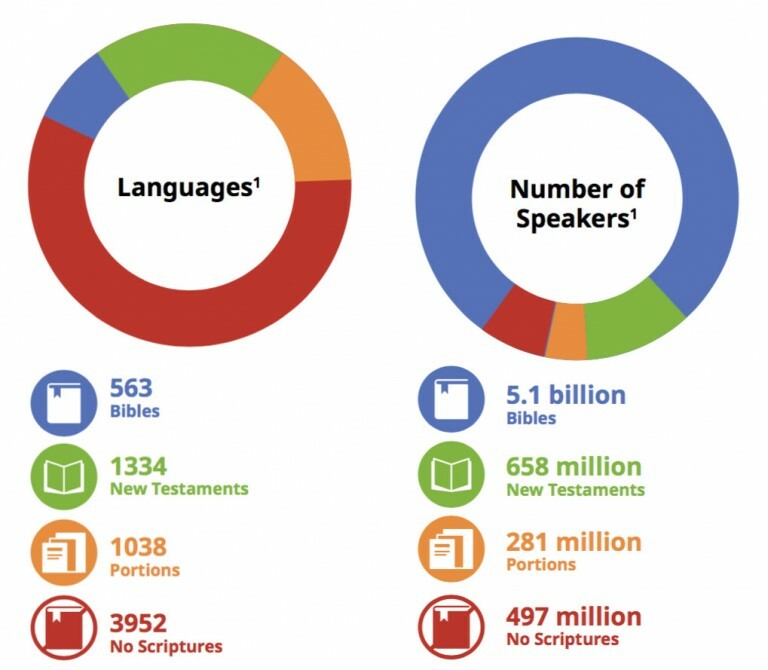 563 languages (spoken by nearly 5.1 billion people) now have a full Bible and a further 1,334 languages (spoken by 658 million people) have a New Testament. This leaves 281 million people with only some portions of the Bible and a further 497 million people with no Scripture translated in their language at all. United Bible Societies is committed to working towards the day when everyone can access the full Bible – so much work still remains to be done. Furthermore, languages are constantly changing; therefore we are committed to ensuring that existing translations are regularly revised and new translations undertaken to meet the needs of the communities that use them. Bible Societies is currently working on over 400 translation projects around the world. The increasing use of the internet offers people greater choice in how and where they connect with the Bible. The Digital Bible Library ® (DBL) is central to our strategy to make the Bible as widely and easily accessible as possible. 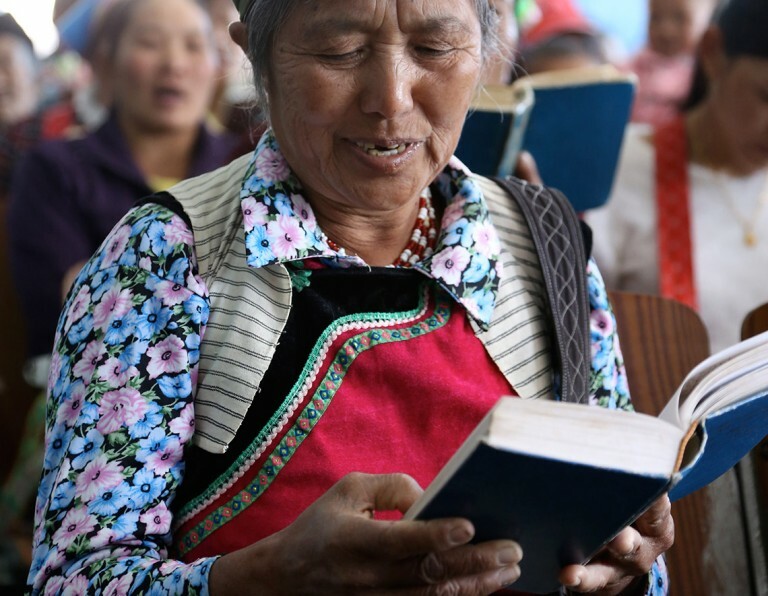 By the end of 2015, the DBL contained no fewer than 1,201 Bibles, Testaments and por tions in 957 languages. These languages are spoken by over 4.6 billion people. The DBL is owned and maintained by United Bible Societies in partnership with other Bible agencies and with the support of the Every Tribe Every Nation alliance. It makes the Bible accessible by providing Scripture texts to the public through partners such as BibleSearch and YouVersion.